Through her evocative intertwined histories of the penitentiary and the monastery, Jane Brox illuminates the many ways silence is far more complex than any absolute; how it has influenced ideas of the self, soul, and society. Brox traces its place as a transformative power in the monastic world from Medieval Europe to the very public life of twentieth century monk Thomas Merton, whose love for silence deepened even as he faced his obligation to speak out against war. This fascinating history of ideas also explores the influence the monastic cell had on one of society’s darkest experiments in silence: Eastern State Penitentiary. Conceived of by one of the Founding Fathers and built on the outskirts of Philadelphia, the penitentiary’s early promulgators imagined redemption in imposed isolation, but they badly misapprehended silence’s dangers. 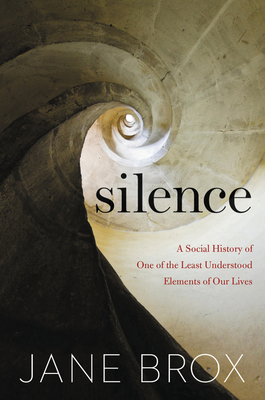 Finally, Brox’s rich exploration of silence’s complex and competing meanings leads us to imagine how we might navigate our own relationship with silence today, for the transformation it has always promised, in our own lives. JANE BROX is the author of Brilliant, Clearing Land, Five Thousand Days Like This One, a finalist for the National Book Critics Circle Award, and Here and Nowhere Else, which received the L. L. Winship/PEN New England Award. She lives in Maine. “Brox writes beautifully . . . Silence for her is a force of nature, awe provoking, like lightning, capable of electrocuting us and of illuminating the night."